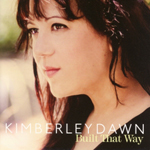 Kimberley Dawn's latest release Built that Way will be in Cd Plus stores and Walmart soon. A star studded line up of writers have come together to create what Kimberley Dawn calls" her best work ever!" 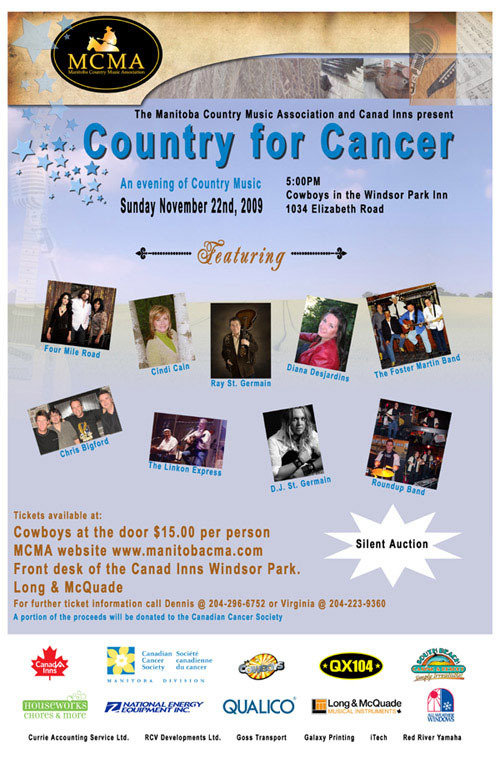 The Country for Cancer event was a fantastic event and the entertainment was unbelievable. I want to say thank you to everyone that volunteered at the event selling tickets and helping with the prizes. I would like to thank Mainstage and Sound Art for working the stage and handling the sound for the event they did an amazing job. I want to thank all the Bands who played at the event, Foster Martin, Chris Bigford, Cindi Cain, DJ St Germain, Ray St Germain, Four Mile Road, Linkon Express, Roundup Band and Hatfield McCoy, everyone gave their heart and soul and deserve a lot of credit for an amazing job. This event was put together in 5 short weeks from its inception to the delivery date. I need to thank all the sponsors who made it possible for us to auction off some amazing prizes. Thank you Qualico, All Weather Windows, TransX, Itech Computer Systems, Goss Transport, RCV Developments Ltd, Currie Accounting Services Ltd., Galaxy Printing, Red River Yamaha, National Energy Equipment Ltd., Cowboys, Canad Inns, QX104, CKMD, Houseworks, South Beach Casino, and Long & McQuade. We videotaped and recorded the event with the help of Steve Skavinsky and Kurt McMullen, thanks guys. A very special thanks to Sue Trach and Coco Titanich for sharing their personal stories and their fight with Cancer. I would also like to thank the MCMA board members for going the extra mile and making this event a big success. Finally I am pleased to announce that we made $7001.25 for the Canadian Cancer Society. Thank you all it was amazing! 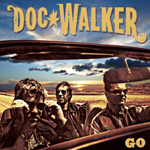 2009 JUNO winners for Country Recording of the Year, Doc Walker, release their fifth full-length album, GO, on September 8. Produced by Justin Niebank, who helped the band's previous award-winning release, Go was recorded at Dark Horse Studios and Blackbird Studios in Nashville with additional recording at Gomie's in Winnipeg and Barrytone Studio in St. Celement ON. After several years serving the MCMA as a member and on the board, Harvey Levy has resigned as an active member of the MCMA Board of Directors. Please join us in wishing Harvey continued success in his on going endeavors, he will be missed. THE SOUNDING BOARD Open Mic has a new home! LIVE @ 725 (Corydon) every Tuesday night. Musicians, songwriters, spoken word artists, comedians. All welcome. Starts at 9 pm. To sign up in advance, email Paulette at liveat725@mysweetspotproductions.com or call THE RESERVATION LINE at 480.8565.